As continental Europeans head to the coasts for their long summer holidays, they will travel through a Europe in turmoil, a Europe that is struggling to remain competitive in a global market, a community that is questioning the very principles on which it was founded. Many of the difficulties the continent is facing have existed for some time, but the euro’s dramatic recent slide against the dollar has rattled both investors and corporations and has brought into sharper focus other, more structural problems with which the European Union is wrestling. There is no doubt Europe is facing some immense challenges. Italy is already in a technical recession, Germany and France are both foundering, and the proposed EU constitution lies in ruins, despite Luxembourg’s belated attempt to resuscitate it. The persistent malaise is encouraging the continent’s perennial malcontents, who are becoming increasingly vocal in their condemnation of last year’s enlargement that saw 10 nations join the union in a flurry of optimism and comradely bonhomie. The gloomiest pundits are predicting a rapid meltdown, with the single currency disintegrating as one nation after another frees itself from the straitjacket of the euro and reclaims its old currency—and the freedom to manage its own monetary policy. 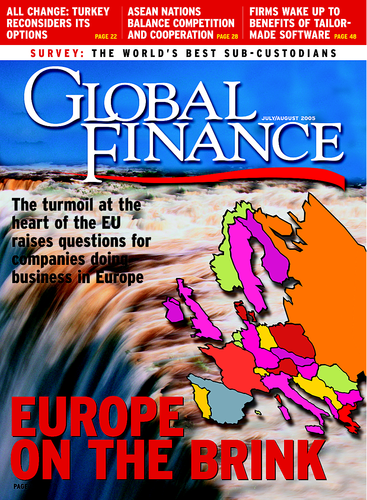 But, as we find out in this month’s cover story, Europe’s single currency is far from down for the count. In fact, as the dollar rose sharply in early July, it appears some Asian central banks took the opportunity to snap up some cheap euros, continuing their shrewd policy of balancing their enormous dollar reserves with a growing stash of euros. With many analysts predicting that the euro will recover the ground it recently lost to the greenback, this is a smart move. Not only is the single currency likely to claw its way back against the dollar; Europe’s economy is poised for continued growth. Labor reform is progressing, albeit slowly, in Germany and France (see Features ), which will help them improve their competitiveness in the long term. And, far from dragging down the region as a whole, last year’s new entrants will bring a dynamism and energy to the EU that will fuel further growth in the years to come. With continued commitment and determination, the state of the union can only get better.